The following explanation of IPC has been previously used in our Broadwell review. Being able to do more with less, in the processor space, allows both the task to be completed quicker and often for less power. While the concept of having devices with multiple cores has allowed many programs to run at once, purely parallel compute such as graphics and most things to run faster, we are all still limited by the fact that a lot of software is still relying on one line of code after another. This is referred to as the serial part of the software, and is the basis for many early programming classes – getting the software to compile and complete is more important than speed. But the truth is that having a few fast cores helps more than several thousand super slow cores. This is where IPC comes in to play. The principles behind extracting IPC are quite complex as one might imagine. Ideally every instruction a CPU gets should be read, executed and finished in one cycle, however that is never the case. The processor has to take the instruction, decode the instruction, gather the data (depends on where the data is), perform work on the data, then decide what to do with the result. Moving has never been more complicated, and the ability for a processor to hide latency, pre-prepare data by predicting future events or keeping hold of previous events for potential future use is all part of the plan. All the meanwhile there is an external focus on making sure power consumption is low and the frequency of the processor can scale depending on what the target device actually is. 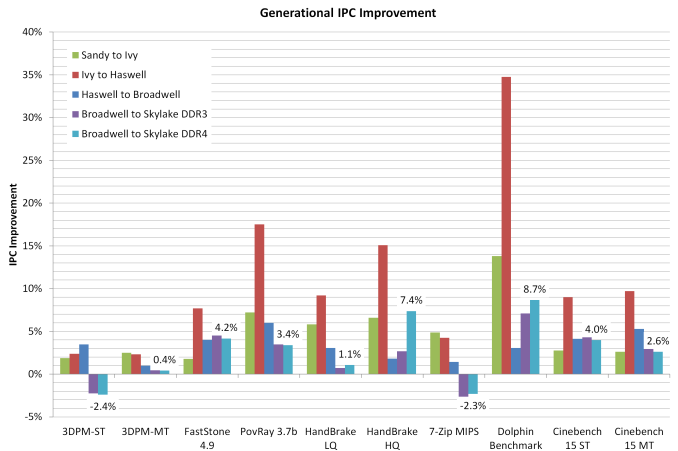 For the most part, Intel has successfully increased IPC every generation of processor. In most cases, 5-10% with a node change and 5-25% with an architecture change with the most recent large jumps being with the Core architecture and the Sandy Bridge architectures, ushering in new waves of super-fast computational power. 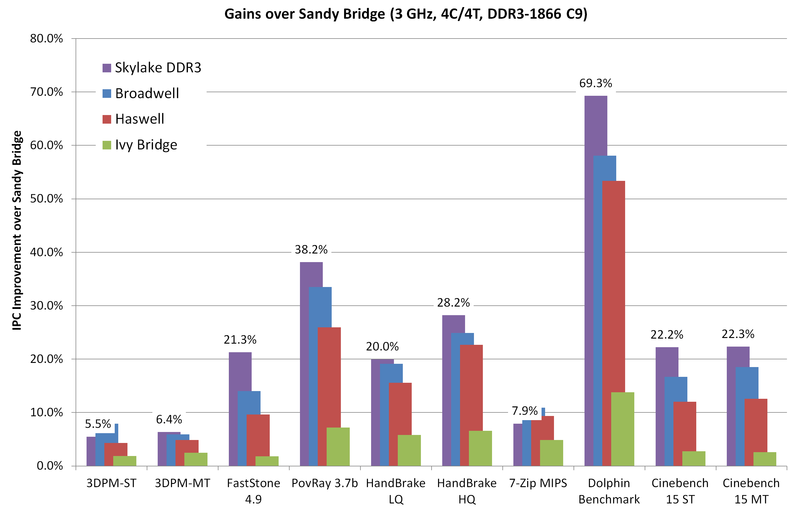 As Broadwell to Skylake is an architecture change with what should be large updates, we should expect some good gains. If we ignore Broadwell and its eDRAM, the purple line, especially from 16MB to 128MB, both of the lines for Skylake stay at the low latencies until 4MB. Between 4MB and 8MB, the cache latency still seems to be substantially lower than that of the previous generations. Normally in this test, despite all of the CPUs having 8MB of L3 cache, the 8MB test has to spill out to main memory because some of the cache is already filled. If you have a more efficient caching and pre-fetch algorithm here, then the latency ‘at 8MB’ will be lower. So an update for Skylake, as shown in both the DDR4 and DDR3 results, is that the L3 caching algorithms or hardware resources have been upgraded. At this point I would also compare the DDR3 to DDR4 results on Skylake above 16MB. It seems that the latency in this region is a lot higher than the others, showing nearly 100 clocks as we move up to 1GB. But it is worth remembering that these tests are against a memory clock of 2133 MHz, whereas the others are at 1866 MHz. As a result, the two lines are more or less equal in terms of absolute time, as we would expect. From a pure upgrade perspective, the IPC gain here for Skylake does not look great. In fact in two benchmarks the IPC seems to have decreased – 3DPM in single thread mode and 7-ZIP. What makes 3DPM interesting is that the multithread version still has some improvement at least, if only minor. This difference between MT and ST is more nuanced than first appearances suggest. Throughout the testing, it was noticeable that multithreaded results seem to (on average) get a better kick out of the IPC gain than single threaded. If this is true, it would suggest that Intel has somehow improved its thread scheduler or offered new internal hardware to deal with thread management. We’ll probably find out more at IDF later in the year. 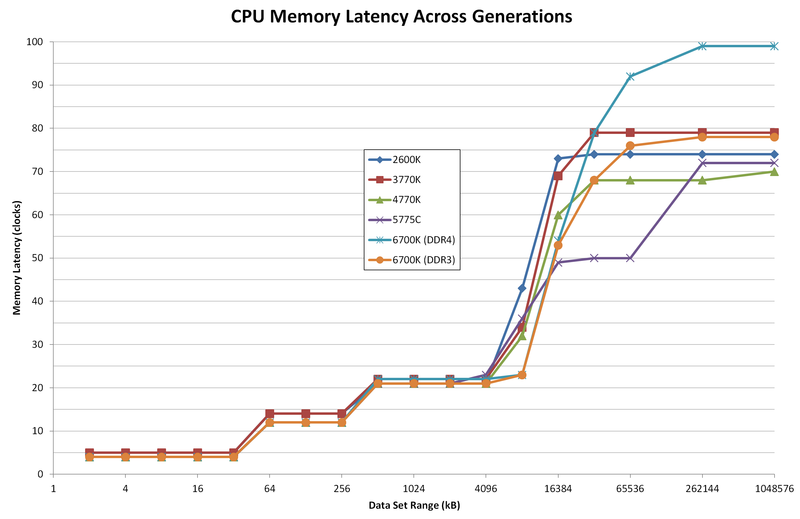 Haswell to Skylake (DDR3): Average ~5.7% Up. This is more of a bearable increase, and it takes advantage of the fact that Broadwell on the desktop was a niche focused launch. The other results in the review will be interesting to see.